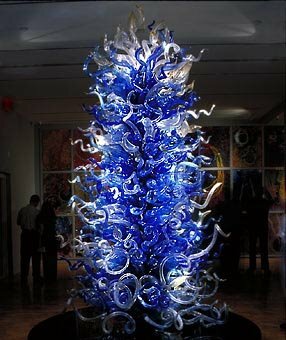 The Official Thomas Bickle Blog: Much Like the Spanish Inquisition, Nobody Expects a Chihuly . . .
Much Like the Spanish Inquisition, Nobody Expects a Chihuly . . .
Thursday morning, as far as I can remember, was bizarre all the way through. Not the least of which because it involved a Chihuly at dawn. We had an appointment at 7:30 to get Thomas's mask made for his radiation treatments. The mask is, I think, made so the radiation oncologist can make sure Thomas's head is in exactly the right spot each time he receives radiation (which will start next week-ish). It looks like a prop from a silly cartoon - like they Thomas ran really fast into a lacross bat and it froze in in that shape. Since we were already living at Children's, we had to have an ambulance drive us the six blocks over to UT Southwestern for the procedure. No amount of my eye-rolling could convince anybody that I could cart Thomas over in the truck for a fraction of the cost, so I had to grin and ...well, at least bear it. If you've ever had the misfortune to run into me pre-coffee, pre-8 am, you can imagine that by "bear it" I mean, "Make the situation unbearable for everyone who's not bearing coffee." The EMT team -four guys and a huge stretcher - arrived at 6 am, and I grumpily finished loading up crying, sleepy Thomas and his gear. I had to let them put him in the back of the ambulance while I rode in the front, an arrangement that neither Thomas nor I liked very much. Fortunately, like almost everyone else we've met through Children's, the EMT guys were great. They all made silly faces -but not the too-close, loud kinds that some people use with kids that would scare any sensible person - and were just really gentle and funny with him and even with grumpy me. Thomas did great under the anesthesia and I did finally find some coffee, both of which probably colored my positive interpretation of the overall event. On the way out, the ambulance driver insisted that we all stop and inspect the Chihuly* tower (like the one above but bright yellow and orange) in the lobby. "Every piece is hand-blown and unique," he said more than once. It was the end of their shift, and the beginning of my long day, but we all stood there for a couple of minutes staring at the sculpture against the rising sun outside. That's why they have art in places like that, I guess. All night and all day all week, we'd been living cancer cancer cancer. And then all of a sudden, there's something I'd never seen before, something I'll never see exactly that way again. Thomas was very impressed, either by the art or by our silly entourage; I'm not sure which. I thought about the artist blowing all those gorgeous glass bowls and tubes all day, and I stopped grumbling about how much the trip would cost us. Overall, I figure it was a steal. I love google.com---it's really helpful. I entered Chihuly and clicked on one website and saw this beautiful sculpture of red and yellow sitting in a boat. Thank you Sarah and Thomas for adding one more piece of knowledge in my life that I will certainly keep. Thank you again- Sarah for your faithful updates on Thomas. Wow. How beautiful!!! I like to think of that moment as a sign of hope and promise. I love you. love this post. the chihuly looks like a sea anemone. :) i love you both. maybe you should just get a direct iv of coffee. i think that would work well for you. the title of this entry wins. I love the title. I think it is amazing that you find a strand of hope and humor in the midst of struggle. I had the best time with Thomas when I watched him I only wished I had more time to spend with him. He is a real trooper.